Howleen Wolf is wearing a top, small circle skirt, and wrap around collar. 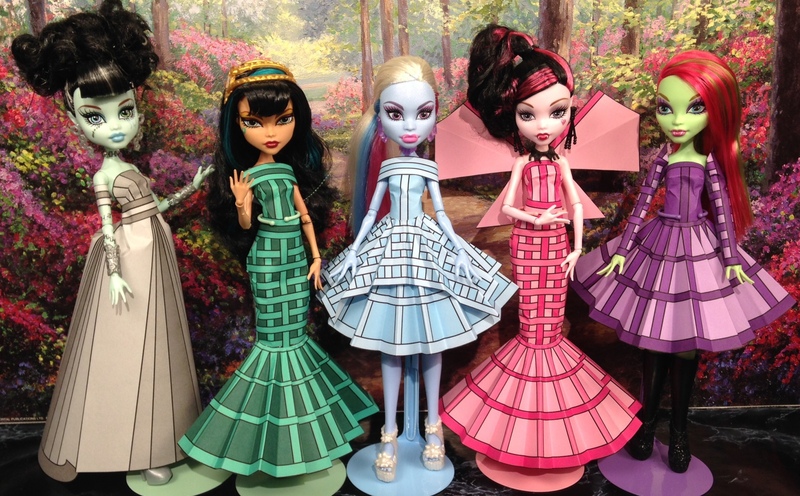 Venus McFlytrap is wearing a top, circle skirt, and straight sleeves with a pointed top. Abbey Bominable is wearing a top, circle skirt, straight skirt over skirt and wrap around collar. Frankie Stein is wearing a top, cap sleeves, flared skirt and belt. Cleo de Nile is wearing a top, mermaid skirt with belt, and wrap around collar. Honey Swamp is wearing a top, elbow length straight sleeves, circle skirt and small circle over skirt. 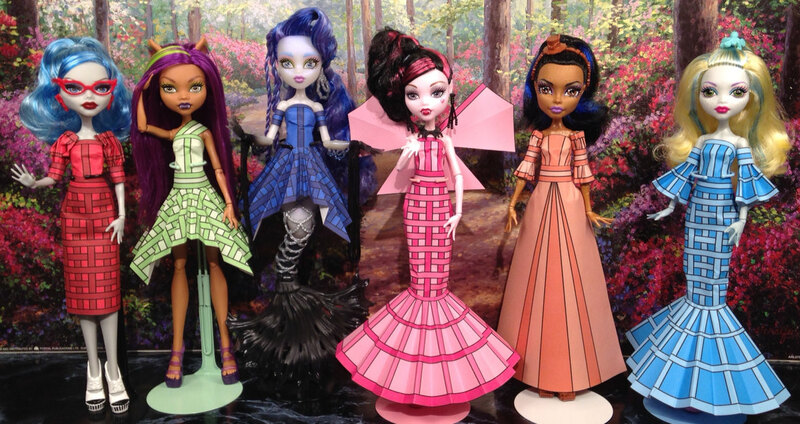 Ghoulia Yelps is wearing a top, straight skirt with belt, and puff sleeves. Target exclusive Clawdeen Wolf is wearing a top, over skirt over skirt with belt, and one shoulder strap. Sirena Von Boo is wearing a top, straight skirt over skirt, and cap sleeves. Draculaura is wearing a top, mermaid skirt, and wings. Robecca Steam is wearing a top, flared skirt with belt, and middle puff sleeves. Lagoona Blue is wearing a top, mermaid skirt, and small half circle sleeves with band around the top. Poppy , on the left, is wearing a top, small circle skirt, and elbow length straight sleeves. Holly , on the right, is wearing a top, circle skirt, straight skirt over skirt, and wrap around collar. The instructions are on this website under “How to Make the Dresses”.